the Son of Man or the Son of God? He answered, Who is He, Sir? Tell me, that I may believe in and adhere to Him. [in fact] He is talking to you right now. He called out, Lord, I believe! [I rely on, I trust, I cleave to You!] And he worshiped Him. This particular Chapter in the Book of John fascinates me. And it particularly speaks to me in light of where God is taking me and my husband, and the ministry He is drawing us to. And here is why ... in this Chapter, Jesus has cured a man born blind since birth, and the man has proclaimed to all who were amazed by this miracle, "The Man called Jesus made mud and smeared it on my eyes and said to me, Go to Siloam and wash. So I went and washed, and I obtained my sight!" Naturally, the Pharisees would have heard of this miracle attributed to Jesus and the man was brought before them, that they might enquire of him how he had received his sight. Again, he gave credit to the man, Jesus. Because Jesus had done this act on the Sabbath, some of the Pharisees proclaimed him a sinner, and asked of the blind man, who did he say Jesus was. The man said, "He must be a prophet." But there was disagreement among the Pharisees on how to consider Jesus ... a prophet, a sinner, or the Son of God ... so they brought the blind man before them a second time and told him to "give God the glory (praise). This Fellow we know is only a sinner (a wicked person)." The man could not or would not declare Jesus a sinner, and the Pharisees threw him out of the synagogue, and that is the starting point of our Scripture today. Which brings me to the point that I would like to make. Various commentaries have disagreed whether the man knew who Jesus was when He approached him at this point in the story; which brings into question whether this man was saved, and if Jesus is willing to heal both the saved and unsaved. As the Lord has brought my husband and myself into further understanding regarding his desire to "set the captives free", we know without a doubt that He is directing us to minister to people like this blind man. That is to say, people who have heard of Jesus, who want to know Him, but are not part of the Church. They have been wounded deeply and are in great need of the healing by Jesus through the Holy Spirit, but because of their skepticism of organized religion, or their fear of judgment by the Church, or their discomfort with the hypocrisy of some Christians, they will never approach the Church for help or healing. But it is my firm belief that Jesus wants to heal them as much as He wants to heal the professed believer inside the Church building. That is why He is using those like my husband and myself, who have been moved to work outside the church; to draw those people to us, so that they are comfortable enough to seek Jesus, (without embarrassment or self-consciousness) and can receive the healing, in His Name, and through the Holy Spirit (that they so desperately need), and be free to progress towards their salvation. 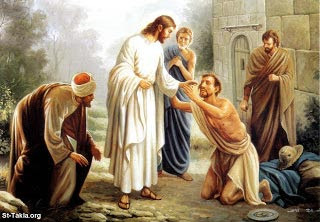 For those in the Church who hesitate, like the Pharisees did, to offer this spiritual and physical healing to anyone who is not a professed Believer, I would like to suggest that they consider this .... Jesus desires that no man perish. And what better glory can be given to Him and the Father than a person who was once blind (to their sin) -- but knows of Jesus -- to be healed in His Name, and by the Spirit, and then to come to Jesus in full acknowledgement that it was His power and saving grace that changed his life? That person, who once would never have darkened the door of a church can be set free to join the Body of Christ, and with a powerful testimony. I just do not believe that we are to keep this freedom to ourselves inside the Church walls. The Scripture says, He came to set the captives free! To me, that implies ALL captives... both saved and unsaved. And by healing them and setting them free, in the Name of Jesus, we just might help another person take those first steps towards entering the Kingdom of God. Isn't that our purpose? I'm appreciative of this post as always. I could completely fill your blog with comments and "us-too's." It seems God is calling many out to this same purpose; finding those thirsty for healing who have barricades with traditional church but desire ekklesia. We were there several years ago and now, after seven years in a big and commendable church, are asking ourselves what God might be calling us to next. It's important for me personally to be cautious criticizing the traditional church (through which God has done so many great things) and find what He is calling me specifically to and how to do it. We all benefit from the examples of others and I look forward to reading more of how you and your husband reach the thirsty un-churched.